In some parts of Africa, elephant numbers are increasing as a result of years of successful conservation efforts. But in some places large populations are giving rise to increased human-wildlife conflict where elephants are known to raid local crops and even threaten peoples' lives. Find out more about elephant management in South Africa and Namibia. Southern Africa just had one of the wettest summers on record, turning its usual adobe brown sunburnt landscapes into verdant green paradises. In South Africa’s Kruger National Park, vegetation has grown thick and dried riverbeds have flooded. Wildlife haven’t had to wander too far in search of food or water. That’s great for the wildlife, but not necessarily for the 1.2 million tourists who come to the world-famous park each year expecting to spot the Big Five — lion, leopard, elephant, rhino and buffalo — that in leaner times are easily found congregating in the open around sparse waterholes. But not to fret, even in the best of conditions one can’t miss the elephants. Not only because they are the largest animal foraging around the park — not to mention the largest terrestrial land animal on the planet — but because they are numerous. In fact, within the first few minutes of entering Kruger’s main gate, a large male bull is easily spotted foraging among the trees without blinking an eye at the herds of gawking holidaymakers — an indication of their high visibility and high densities in the park. As elephants consume up to 200kg of plant matter in a single day, when space is limited, as it usually is, they often come into conflict with other animal species, as well as people, who are competing for many of the same, often scarce resources. Kruger National Park covers an area of some 20,000km2 — about half the size of Switzerland — but it still doesn’t seem big enough to accommodate a growing elephant population. Unlike many populations in Africa which remain endangered as a result of years of poaching and habitat loss, elephants in Kruger are growing at a rapid rate. Since the park stopped culling elephants about a decade ago as a result of international pressure, numbers have gone from 7,000 to over 12,000. According to local officials, the park’s habitat can only sustain about 7,000 over a long period. Any more and it will add pressure to an already fragile and carefully managed environment. “With a natural growth rate of 6–8 per cent a year, the population currently has the potential to double their numbers every decade,” said Dr Hector Magome, Conservation Services Director of South African National Parks (SANParks), the government department responsible for managing the country’s 22 national parks. 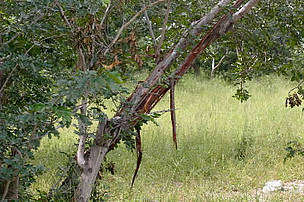 In the course of their foraging, elephants often strip the bark of trees of such important tall tree species as ancient baobabs, knobthorns — where birds of prey often make their nests — and marulas, whose fruit has an extremely high vitamin C content and is used to make jam, juices and alcoholic beverages like the popular South African liqueur Amarula. Rare plant species, such as the lalla palm, are also being damaged. According to aerial surveys in the park, large trees are declining by about 45 per cent in observed areas. In addition to tree loss, elephants have been blamed for breaking the park’s boundary fence and reeking havoc on neighbouring villages, especially their crops. The broken fences also allow species like buffalo to leave the park, some carrying foot and mouth and bovine tuberculosis which infects livestock and have a negative impact on the local economy. Outbreaks of foot and mouth disease to the west of Kruger National Park have increased in recent years. Managing a recent foot and mouth outbreak cost South Africa some US$15.5 million. About 1.5 million people live near Kruger and several hundred thousand in bordering Mozambique. Because of these large population areas, there are increased concerns of rising human-elephant conflicts. There have also been reports of increased elephant attacks on tourists and personnel. Several options are currently being considered by South Africa and other southern African range states to tackle local over-population of elephants. These include range expansion through the establishment of cross-border protected areas and protection of migration corridors, translocation to under-populated areas, contraception, and perhaps the most controversial, culling — the intentional reduction of elephant populations. Each option has its advantages and disadvantages, each its costs and constraints. WWF has for years been working to establish trans-frontier conservation areas in Africa to help conserve elephant migration corridors, to reduce human-elephant conflict, and to establish community-based natural resource management programmes. The global conservation organization has also helped establish new protected areas at the national level, as well as helped translocate elephants from South Africa to an under-populated trans-border park in Mozambique. But translocation is expensive and labour-intensive and can only help remove a limited number of “unwanted” elephants — up to only 14 at a time, according to Kruger staff. Translocating one elephant can cost as much as US$8,000. Despite the price tag, many have been taken across the border to Mozambique, but the elephants have raided the crops of communities still living in the area, and some have actually found their way back to their traditional feeding grounds in Kruger — making the whole operation ineffective. Contraception methods have also been employed over the years, but this has proven to be expensive and the park’s veterinarians say it can only stabilize populations, not reduce them. It is because of such complex challenges that elephant culling is once again being talked about to address the problems of elephant overpopulation and insufficient space in certain parts of southern Africa. Kruger, as well as other southern African parks, used to cull small numbers annually to maintain populations at levels authorities considered suitable for their environment, but stopped under strong international pressure in 1995 after populations in other parts of Africa had been decimated by decades of systematic poaching. The status of the species, however, still varies greatly across Africa. Some populations remain endangered due to poaching for meat and ivory, habitat loss, and conflict with humans, while others are secure and expanding, like in South Africa and its neighbouring countries as a result of successful management and enforcement. “No one likes killing elephants, but we have a responsibility to maintain biodiversity,” said Kruger’s Dr Whyte, an elephant specialist who has worked in the park for the past 36 years. Anticipating an international backlash because of the sensitiviy of the issue, SANParks and the South African Environment Ministry have been debating any potential cull (no decision has yet been made at the time of writing this article), taking in views from a number of stakeholders, including top scientists, academics, conservation organizations such as WWF, animal welfare groups, local communities bordering Kruger, neighbouring countries that also have large elephant populations, and many others. “We acknowledge the challenges faced by South Africa in managing its expanding elephant population and support the consultative process and attempt to take on board all points of view on this very important and complex issue before making a final decision,” said Dr Susan Lieberman, Director of WWF’s Global Species Programme. “Culling should only be considered as a last resort when all non-lethal options have been investigated and thoroughly tried and tested,” she added. The elephant story in some of South Africa’s neighbouring countries is different. In Namibia’s north-eastern Caprivi Strip, where Angola, Botswana, Zambia and Zimbabwe all meet, there are thousands of elephants crossing borders at any given time. In northern Botswana alone there are an estimated 100,000-plus elephants growing at a rate of 5 per cent a year, and are damaging the vegetation in protected areas such as Chobe National Park at a record pace. Elephant numbers in this part of southern Africa far exceed the population in Kruger and are also causing huge headaches for wildlife management and local people. 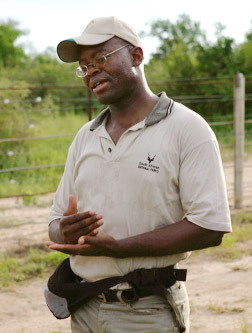 “There are definitely too many elephants here and they are causing a considerable amount of damage to farmers’ crops and even people,” explained Beaven Munali, a field coordinator with the WWF-funded Integrated Rural Development and Nature Conservation (IRDNC) in the Caprivi Strip, which is experiencing a rise in elephant-human conflict. Beaven’s grandmother was killed by an elephant when he was only five years old and the issue is close to home. Conservancies are a unique conservation system in Namibia that gives local communities responsibility and right of ownership over their natural resources and wildlife. Registered conservancies acquire the rights to sustainable wildlife hunting quotas set by the country’s Ministry of Environment and Tourism. Wildlife, including small numbers of elephants, can either be hunted and consumed by the community, or sold to trophy hunting companies, with proceeds going directly to the communities. “Communities once received nothing for the use of their resources, now they are getting paid for it,” said Chris Weaver, Director of WWF Namibia. In the Samambala Conservancy, for example, the community can earn as much as $US11,000 for an elephant. 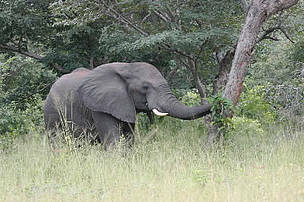 In the nearby Kasika Conservancy, there are quotas for four elephants, six buffaloes, two hippos and two crocodiles. These quotas, if filled, have a potential worth of over US$80,000. “Community attitudes towards wildlife conservation have changed since the establishment of conservancies in my region,” explained Chief Joseph Tembwe Mayuni, Chief of the Mafwe tribe, which lives on the Mayuni Conservancy in Namibia’s Caprivi Strip. Although communities in Namibia have become more tolerant of wildlife as a result of the conservancies, it doesn’t mean that the human-wildlife conflict has gone away. Elephants in many places still disrupt daily life. Children in the Impalila Conservancy near the border with Botswana are often too frightened to go to school because elephant herds are in the area. As a result, many children’s education has suffered. Sometimes the conflict ends in tragedy. On the Kasika Conservancy in recent years, five people have died from wildlife attacks — three from hippos, one from a crocodile, and one from an encounter with an elephant. About 1,600 elephants come across the border from Botswana’s Chobe National Park each year from June to November to graze on the lands of the Kasika Conservancy. Elephants are also among the main culprits behind crop raiding, easily damaging a farmer’s yearly income in a matter of minutes. Elephants are not just big, but smart. They can easily knock down fences protecting crops, even disable electric ones, and are not scared of loud noises made by farmers defending their crops. But it seems that they have one weak spot — they don’t like spicy food. Chilli peppers have shown to be an effective elephant deterrent in Namibia, as well as other parts of Africa experiencing elephant problems. 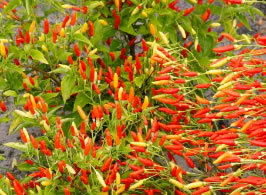 Either mixed with engine oil on rope barriers around the fields or mixed with dried elephant dung and burned to make “chilli bombs”, the spicy capsicum seems to work as an effective elephant repellent. Albert Stenzi, another farmer from Sikaunga, has seen his sorghum fields raided five times in one year. Through a WWF-supported project, several conservancies are now learning to cultivate several plots of chillies to be used for scaring off elephants that raid their crops. “It’s a simple and effective solution,” said WWF’s African elephant expert Dr PJ Stephenson. * Mark Schulman is Managing Editor at WWF International, based in Switzerland. • The African elephant once ranged across most of the African continent from the Mediterranean coast to the southern tip. Although it is difficult to assess accurately population numbers, it is thought there may have been three to five million African elephants in the 1930s and 1940s. However, heavy ivory poaching, in addition to habitat loss, saw elephant numbers decline sharply in the 1970s and 1980s. Today, it is estimated that between 400,000 and 660,000 elephants survive in Africa. • In 2000, WWF launched its African Elephant Programme. With 40 years of experience in elephant conservation, WWF’s current programme aims to: increase protection and management of elephants in Africa; build capacity within elephant range countries to manage and mitigate conflict between humans and elephants; and control the illegal trade in elephant products. • WWF has recently supported the IUCN Species Survival Commission African Elephant Specialist Group to produce technical guidelines for the management of local over-population of African elephants. This is expected to be published in early 2007 and will provide park managers and national governments with the information they need to make informed decisions about the options available to them. African elephants on the move. Increasing numbers of elephants are causing major changes to the vegetation of the park, destroying trees and reducing habitat available for other wildlife species. At what point do you want to stop that? – Dr Hector Magome, Conservation Services Director of South African National Parks (SANParks). Elephant bull feeding on fresh tree branches. Elephants consume up to 200kg of plant matter in a single day. Chobe National Park, Botswana. Young tree freshly stripped by foraging elephants. Chobe National Park, Botswana. 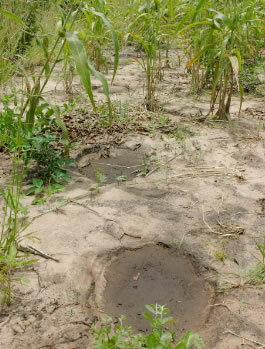 Fresh elephant tracks in a farmer's sorghum field. This was one of several elephant raids on this small farm plot. Sikaunga, Kwandu Conservancy, East Caprivi, Namibia. Chilli peppers – either mixed with elephant dung to make a "chilli bomb" or smeared on a fence – have proven to be an effective elephant deterrent. Chilli plot, Kwandu Conservancy, East Caprivi, Namibia. Community attitudes towards wildlife conservation have changed since the establishment of conservancies in my region. 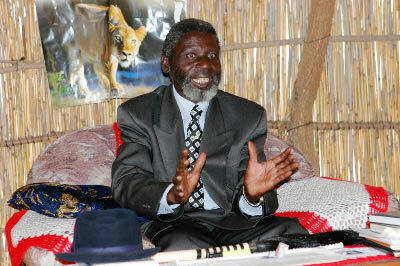 As my people see that benefits are going directly to the community, they know it is in their interest to look after wildlife – Chief Joseph Tembwe Mayuni, Chief of the Mafwe tribe, Mayuni Conservancy, East Caprivi, Namibia.